Police commissioner Mike Bush confirmed that one person is in custody, but said it was unclear if others were involved. Mohan Ibrahim, who was in the area of the Al Noor mosque, told the New Zealand Herald: “At first we thought it was an electric shock but then all these people started running. Witnesses at the Al Noor mosque, located in central Christchurch along Deans Avenue, facing Hagley Park, reported seeing people bleeding on the ground outside the building, but such details have not been confirmed by police or officials. One unnamed survivor told TV New Zealand he saw a gunman shoot a man directly in the chest. He estimated that the shooting lasted for 20 minutes and that up to 60 people may have been injured. “What I did was basically just waiting and praying, God please, let this guy run out of bullets,” the witness said. Police Commissioner Mike Bush said: “Police are responding with its full capability to manage the situation, but the risk environment remains extremely high. Who has been caught up in the attack? 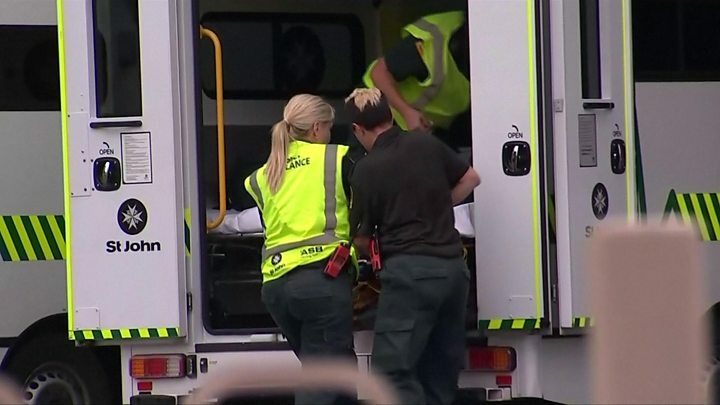 As well as numerous witness reports of casualties, a reporter following the Bangladesh cricket team, who are currently in New Zealand, tweeted that the team had “escaped from a mosque near Hagley Park where there were active shooters”.